Chiefland resident Michael Gaither and High Springs resident James “Pete” Evans were recently recognized for their military service by Haven Veteran Volunteers. Born in Alabama, Gaither served in the United States (U.S.) Army for 13 years. During his time in the U.S. Army, Gaither served in the Military Police Corps. Outside of his military career, he also worked as the head electrician at a textile plant. Evans served two years stateside. As a civilian, he was a mechanic with a transport lines company, a business owner and a farmer. The Haven Pinning Ceremony for veteran patients also includes a veteran pin, a thank you card signed by the staff and a certificate of appreciation from Haven which are all presented by volunteer veterans. Veterans were also presented with a red, white and blue blanket knitted by a volunteer. The presentation ends with a salute to honor the veteran’s service. 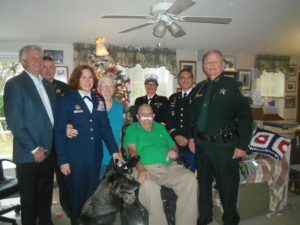 In the Photo (l. to r.): Charlie Stone (Florida House of Representatives), Brett Beauchamp (Levy County Sheriff’s Office), Air Force Major Kelley Jeter, Kaye Gaither, Honey (Michael’s Service Dog) with Michael Gaither (seated), Robin McCracken (Haven Volunteer), Army Colonel Jose Madera – Retired, and Sheriff Bobby McCallum (Levy County Sheriff). James “Pete” Evans of High Springs.